Popped lotus seeds have been pegged as a strong ingredient for the free-from market as they are suitable for people with nut allergies as well as being gluten-free. 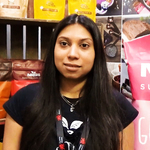 Akhil Kumar, Founder of Guruji, was launching a range of popped seeds at the show, highlighting its superfood flavors – such as cacao. Healthy snacks incorporating functional, as well as sustainable, benefits, were prominent at IFE in London, held in March.